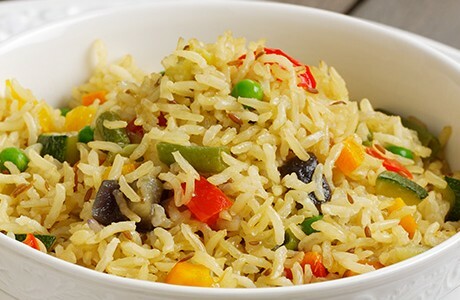 Wholegrain Basmati is not only a nutritious grain but delicious when cooked with lentils, vegetables and spices like this spicy vegetable pilau. Soak the rice for 30 mins in warm water and then rinse thoroughly and drain the water. Heat a pan with 1 tsp vegetable or sunflower oil and add the cumin seeds and cinnamon. Cook for 1-2 minutes then add the onions. Sauté the onion for 5-7 minute or till starting to brown then add the vegetables. You can use peas, potatoes, sweetcorn, peppers, carrots and anything else you may have in the fridge like butternut squash chopped up. Add the turmeric, salt, chilli, garlic, ginger, and rice and mix in with the 700ml water and bring to boil. Simmer on a low heat for 20 mins until the water is absorbed. Serve and enjoy with a dollop of yogurt .